Superb acceleration. Rip-roaring speed and control like you've never felt before. These are definitely not the cars you drive every day! Engines with 450hp will take you on roads you thought you knew, on surfaces you've always considered ordinary. We're sure you'll never look at asphalt or dirt the same way again. Experience the thrill of a full sized racetrack that your favorite pro's chase the cup on. Our experienced instructors will make sure you have the skills, knowledge and adventure of a lifetime. Adrenaline has many NASCAR experiences across the states. You can either choose to Drive a NASCAR on various racetracks or take a Ride in a NASCAR with passenger hot laps. These NASCAR drives and passenger Hot Lap Rides will not be forgotten and gift vouchers are available for all these adventures and experiences. If you have always wanted to experience what it's like to drive a NASCAR around a real racetrack then this is for you! Your motorsport adventure begins at the racetrack with a briefing conducted by experienced instructors. The briefing will cover techniques on cornering, apexes and exiting, efficient braking and acceleration, steering, gear changes and general car control. Safety and track awareness will also be discussed. Feel free to ask questions so that you feel comfortable to get in the car and put theory into practice. Before getting into the driver's seat, you will feel completely comfortable taking these powerful machines to their extreme limits. With the briefing and preparation completed, it's time for you to drive. During your driving session, an instructor will be buckled into the passenger seat watching you drive and giving you feedback and encouragement. his ensures that you learn the correct techniques and drive safely. The first “warm up lap” allows you to familiarise yourself with the car and track, your confidence will grow and your skills will improve as you learn how to gain more control and speed. Then there will be no stopping you! Passenger Hot Laps - Ride In a NASCAR. The NASCAR Hotlaps have come about as a result of repeated requests from the public to feel for themselves the exhilaration of the raw horsepower they watch on television or at the track. The noise, the acceleration, the braking, the grip on cornering is something that can only be fully appreciated from within the car. 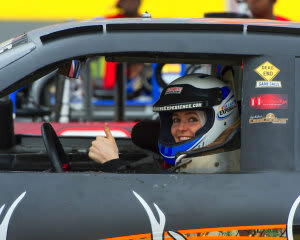 With an experienced NASCAR driver at the wheel and you secured in the passenger side race seat by an engineer designed 4-point harness, you will be introduced to the world of motor racing. 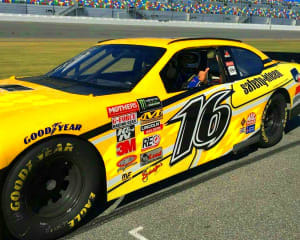 Until now, riding in a NASCAR with an experienced race car driver has been reserved for corporate sponsors, competition winners or race car crew only. The heat of the asphalt and the smoke of the tires will cloud your senses like nothing has ever before; and that's just when one of our professional drivers is giving you top notch tips with acceleration, brake control and steering before you take your turn in some of the most powerful NASCAR's available in the race circuit today. After you test your skills get ready for a few laps of mind-blowing intensity as your professional driver once again takes the wheel to show you how to really throw down. See the smoke, smell the tyre burn. It's a sensory overload you won't be able to get enough of. At Adrenaline, you're in your own little slice of heaven. We've got big engines,adrenaline pumping asphalt and let's get dirty dirt courses. Not to mention of course, the professional instructors who will show you how to expertly and safely take these cars to their top speeds before they throw down the gauntlet and give you a taste of real life competition. Book a NASCAR racing experience today. Or buy a NASCAR racing gift voucher for a friend.